At DSA, we offer a variety of ways for members to get involved, stay informed and meet other members. From our large annual events to monthly breakfast forums, and from roundtables to committees, we’ve got something for everyone. We also encourage you to stay connected through our monthly newsletter, eblasts and social media. And don’t forget: anyone who works for a DSA-member company can attend events, sign up for committees and receive member-exclusive correspondence. Join us and help shape downtown and the city. 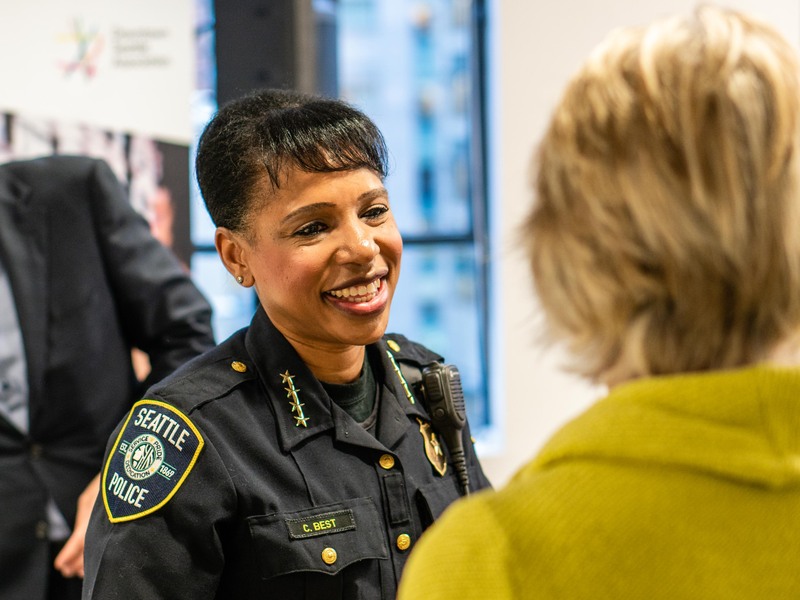 Major DSA events and more intimate gatherings offer high-quality networking and connections to Seattle business leaders and public officials. State of Downtown More than 1,200 attendees gather at our signature annual event where DSA President and CEO Jon Scholes offers economic analysis on downtown and shares insights on Seattle’s future. Attendees also hear from a national speaker. Held in February each year. Annual Meeting Half meeting, half party, at this event we review DSA/MID year-end accomplishments, recognize of new board leadership and present our annual City Maker award. Held in June each year. City Maker Breakfast Expert panels discuss issues facing downtown and our region. Held monthly in spring and fall. DSAccess Early and exclusive behind-the-scenes access to projects, people, information and issues. Six to eight events annually. President’s Roundtable An informal conversation with our President and CEO about issues impacting downtown and your business. Members receive one invitation annually. Held monthly. Young Professionals Group Our Young Professionals Group combines a brief program with networking in a fun, relaxed atmosphere. Held quarterly. These engagement opportunities allow members to dig into issues impacting downtown and DSA. Communications & Marketing Roundtable This group of communications and marketing professionals meets quarterly to learn what’s happening at DSA, share updates from their own organizations and provide feedback on DSA projects and initiatives. Downtown Download At this new economic development series, we take a deeper look at the initiatives and issues shaping downtown. These meetings are free and open to all DSA members. Held bimonthly. MID Clean & Safe Committee This committee receives updates and provides feedback on the work of our Clean, Safe and Outreach teams within the Metropolitan Improvement District. Held six times each year. Resident’s Council Steering Committee DSA’s Residents Council provides a forum for resident members to connect, advocate for and work together on issues and projects of common interest. Held monthly excluding February, June and December. For details on the benefits of DSA membership, contact our Senior Member Relations Manager, Carolyn Tow, at 206-613-3205 or carolynt@downtownseattle.org. Our events are great channels to elevate your brand with influential downtown audiences. If you would like to explore a tailored partnership, we’ll put together a sponsorship plan that matches your priorities for the greatest impact.